So it already sold out? ...Does the statue not look a little cross-eyed? Least the E-Tank looks decent. It's better than the 25th ann statue in my opinion. Amazon usually shows items as sold out even if they haven't yet gone on sale. A makeshift placeholder, pretty much. Lol, not again! This was one of the primary concerns back when the original statue was being made. Capcom got a ton of conflicting feedback about the eyes. Eventually, the eyes were distanced from the center, to which a lot of people complained. I didn't mind it much, since it gave it a stoic statue look, though with this one, they've perfected the face. You'll notice other Mega Man figures and lots of official artwork showing both eyes situated towards the center. @whitetrashshayno @everyone_else They had preorders opened up a few days ago, I was able to snag an order then. So I don't know if they closed it down for now or if they legitimately are sold out. Only Xbox One was available before, but I dunno if PS4 was ever for sale. I'm hoping it's not sold out because I really wanted the PS4 edition. Yea, I dunno if the status is worth $100.....it looks cool, but that's almost half the price of a First4Figures sculpt, which are extremely high quality. While I agree F4F's sculpts are higher quality. 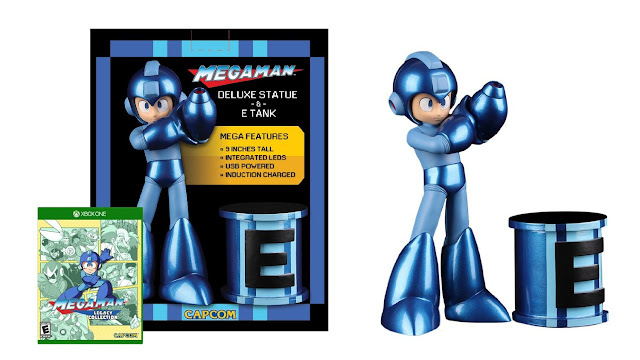 Personally I don't think they look right, aside from Proto Man (which I have ordered). They're X was looking good, but even then.. his nonsensical pose and jet streams out of his feet kept me away from that too. No, Zero is another example, he's too short and stubby looking. And his arms (the black parts) are awkwardly scrawny. Let's see... The Old mold was around $99.99. And since I already have it, there's no need to get this one. If this had been a different mold I'd get it. Plus the old mold was suppose to be limited. How is Amazon able to sell the same thing? Same mold/pose, but this is a different statue. I'm sure it's made from a different material too as it needs conductivity to light up when touching the E-Can. And thanks to Amazon, the international shipping is super cheap (albeit the exchange rate is a heart breaker)! Thanks too for the heads up Rockman corner, I still regularly kick dirt about missing out on the Mighty No 9 Signature edition, but so glad I got this.